When climate first appeared on the Tasmanian policy agenda in 2007, Lara Giddings was Paul Lennon’s health minister and Cassy O’Connor was stomping around mudflats doing her darndest to kill off a waterfront development at Ralphs Bay. To his great credit, Premier Lennon gave strong personal support to climate action, setting in motion a process that culminated in the landmark Climate Change (State Action) Act 2008. But by the time his climate bill was finally debated, he had left Parliament. In August 2008, just as the bill’s second reading debate was beginning in the House of Assembly, O’Connor took her seat as the replacement in Denison for the Green’s retiring leader, Peg Putt. She was quickly into her stride, berating members who thought the bill’s legislated targets were too ambitious and arguing passionately for still stronger measures and targets. Approaching five years on, no longer attacking from the sidelines, O’Connor is finding life a lot tougher in the hot seat of climate change minister. In 2011 her climate “action plan” was so hog-tied by the Giddings government’s budget constraints that it may as well have stayed in the drawer. Unhappy at the negative response to this “inaction plan”, she changed tack, temporarily shifting focus from reducing greenhouse emissions, or mitigation, to planning for a changed future climate (adaptation) — the first of two stages in developing a comprehensive climate policy. In October O’Connor released an issues paper, “Adapting to climate change in Tasmania”, which sought public response to assessed climate impacts on Tasmania’s natural systems, industries, infrastructure and communities. I’m told that a report on that response will be out “within weeks”. Mitigation is what you choose to do; adaptation is what you’re forced to do. We need an adaptation plan because our climate will change, but the longer it takes to get emissions down the more unstable our climate will become and the tougher it will be to adapt. New York Times writer Thomas Friedman put it best: “We need to manage what is unavoidable and avoid what is unmanageable.” Mitigation — what we must do to avoid the unmanageable — is the subject of a new discussion paper, “Low Carbon Tasmania”. The modest “issues paper” designation conceals quite a package. Laying out in clear and direct terms the actions by which Tasmania can reduce its emissions over the long term, “Low Carbon Tasmania” is streets ahead of its predecessors. “Climate change is the biggest challenge we have ever faced,” is O’Connor’s opening statement. She follows it up with a solid argument for working hard to lower emissions. Tasmania’s per capita emissions, while below those of other Australian states, are still among the world’s highest. With this in mind, the issues paper raises the option of interim targets (such as generating all electricity from renewable sources) for 2020, as a means of tracking the state’s progress to its legislated target of a 60 per cent reduction in emissions by 2050. “Low Carbon Tasmania” identifies nine key categories of action: renewable energy, transport, energy-saving in homes and workplaces, low-energy cities and towns, low-carbon farming, using managed forests for carbon offsetting, reducing government emissions, supporting community initiatives, and minimising waste. Three things set this document apart. One is the inclusion of a dedicated section, long overdue, that would require government to put its money where its mouth is by cutting its own emissions. Another is its focus on practical outcomes. It lists 72 potential actions, each with a supporting rationale that where possible identifies annual emission savings. In this regard “Low Carbon Tasmania” marks a significant advance on the failed 2011 plan. O’Connor has consulted widely and well, drawing on the knowledge and passion of people like Phil Harrington, principal carbon and energy consultant for engineers Pitt & Sherry. The third is its optimistic tone. “Tasmanians need to know that we can still enjoy prosperous and fulfilling lives while dealing with climate change,” says O’Connor. To build optimism about the opportunities available from cutting emissions, rather than to present it as a daunting task, she says what needs to be done in positive, motivating language. Now the plan faces two more crucial hurdles. The first is gathering public opinion on actions that we can all relate to, such as whether drivers of fuel-efficient cars should pay less for registration, how large energy users might be persuaded to use less, or whether home sellers should be required to disclose energy efficiency at point of sale. Having done that, the second challenge for O’Connor is securing Cabinet’s endorsement of both mitigation and adaptation plans, probably united in a single climate strategy and likely to go to Cabinet late this year. In 2008, speaking in support of the Climate Change (State Action) Bill, Premier Lara Giddings talked about Tasmania’s “leadership in a low carbon world”. In the lead-up to next March’s state election she will have the chance to start living that dream. 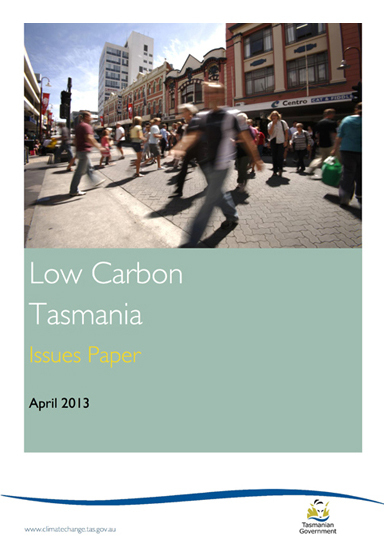 • “Low Carbon Tasmania” can be downloaded here at the Tasmanian Government website. This entry was posted in adaptation, agriculture and farming, biodiversity, biological resources, carbon, carbon emissions and targets, carbon offsetting, changes to climate, climate politics, climate system, energy, energy conservation, energy efficiency, forests and forestry, hydro, land use, leadership, public opinion, renewable energy, social and personal issues, Tasmanian politics, trees and tagged adaptation, agriculture and farming, biodiversity, biological resources, carbon, carbon emissions and targets, carbon offsetting, Cassy O'Connor, changes to climate, climate politics, climate system, energy, energy conservation, energy efficiency, forests and forestry, hydro, land use, Lara Giddings, leadership, Paul Lennon, Peg Putt, Phil Harrington, Pitt & Sherry, public opinion, Ralphs Bay, renewable energy, social and personal issues, Tasmanian politics, Thomas Friedman, trees. Bookmark the permalink. Just a small clarification – I did do a small piece of work for the Tasmanian Climate Change Office, and I hope that it helped to shape thinking in the Government’s recent issues paper in some small way. But I have not been asked to, and nor have I, endorsed this paper. Like you, I agree it’s a much better offering than we’ve seen in the past, and I think the climate community will find some good things to say about it. But – as someone who’s worked as a professional in this field for 27 years now – I can’t count the number of issues paper, discussion papers, draft action plans and fine sounding speeches that I’ve seen from governments, local, state and federal, over this time. Words are cheap. Action is what it’s about. The Tasmanian Government has an appalling record of inaction on climate change. As we speak, it is prevaricating about whether to retain the only generally-available financial incentive it has in place for renewable energy, Aurora’s feed-in-tariff for roof-top solar, which is now threatened by Aurora’s privatisation. The 2011 Draft Renewable Energy Strategy has never been endorsed or embraced by this government. We were the last state to adopt 6 star housing. We still refuse to join in with the national measure of phasing out electric storage hot water systems, four years after this was agreed by COAG. Climate policies and strategies can only be judged by what the atmosphere sees – an increase in emissions, or a decrease? This is ultimate judgement on the soon-to-be-defunct Carbon Pricing Mechanism, for example – emissions were planned to rise until 2030 under this scheme, and that was before the decision to link the price of carbon in Australia to teh junk bonds of the carbon world in Europe. Let’s hope – despite all the evidence of the past – that this paper can lead to some genuine action at last.